Tidiness is really not one of my strong points, so by mid-afternoon our house can look pretty chaotic! However, I know that Andrew appreciates a tidy home and so I like to try and do a quick clean up shortly before he arrives. 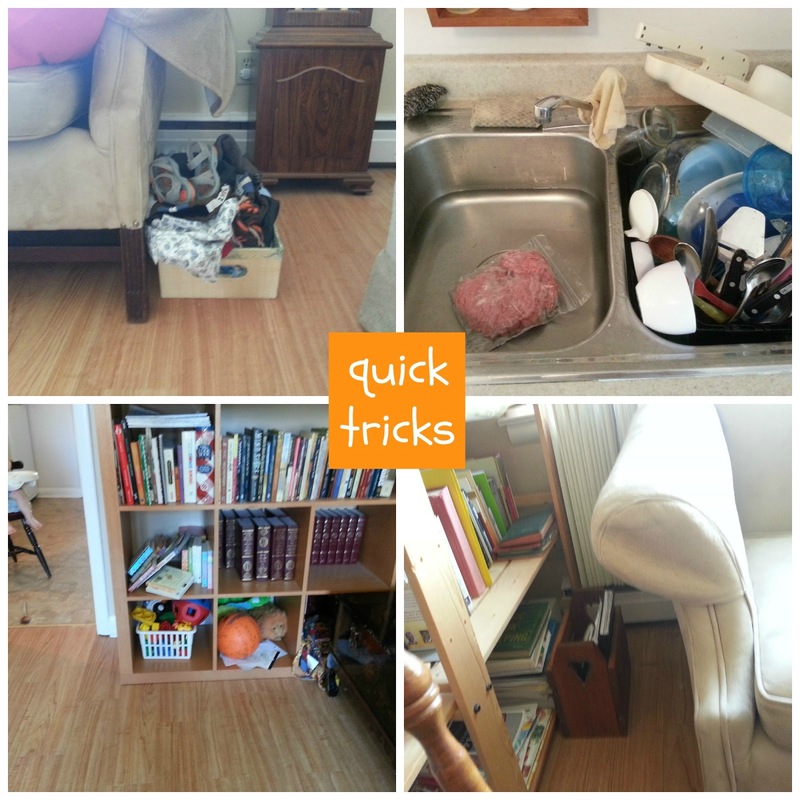 It doesn't take very long (anywhere from 5-20 minutes), and the goal really is just to TIDY, not clean. Today I put the timer on for 20 minutes to accomplish this goal and it only took me 15, even with washing the dishes. 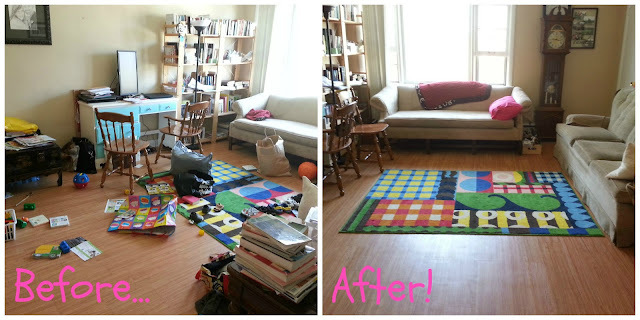 I took some before and after photos so you could see what the state of the place was before, and the level of "tidy" we were aiming for after! 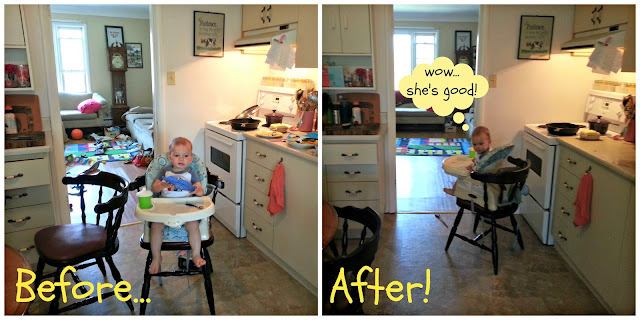 As you can see, a big part of the quick clean-up is making this a snack-time for our toddler! In his highchair he is much less able to undo the clean-up, and it allows me to focus for a concentrated amount of time on the task-at-hand! One of the main ways I am able to accomplish this quick clean is by having "buckets". Pictured below you can see we have three cubbyholes in the bookshelf allotted for Jake's toys and books. This means I can just toss them all in there, and voila - his toys are tidied! We have a similar system for his stray clothes, shoes, and diapers with a little basket beside the couch where those things go. What are your tips for doing a quick clean-up at the end of the day? 10 Tips for a Quick "Tidy-Up Time"
This is just what I do because I'm definitely not the tidiest, either. :-) Thank you for sharing!! I love this post, Stephanie... especially the adorable pictures of your little man! Thanks for the helpful and practical tips, and for a peak into your lovely home! This is a great post full of practical helps! Your little guy is adorable and your home looks cozy and inviting! Thanks so much! Awwwww, what a little sweetie you have there! I am sure that your hubby loves coming home to a peaceful orderly home, and as you said, it only took minutes. When mine were little we had three toy pickups a day, before lunch, before dinner and before bed. I do remember that toddler age because it seems like they get it out just as fast as you can put it away, lol! My kids are young adults now and I still find myself having to remind them to put their dishes in the d.w. or put their shoes in the basket. I guess some stuff you never outgrow, lol! I like that three times a day idea - thanks for sharing! The box idea is awesome, I have one for the toys in the living room as well. At night before bedtime I usually "sweep" the house for stray items - remotes go back where they belong, glasses left in the living room are returned to the sink, papers squared if not put away etc. This way the house is clean when my husband gets up in the morning and returns from work (he leaves and comes home before I do). I actually came to your post earlier today, it caught my eye on the link ups because it was similar to mine, I didn't realize it was you though when I replied to your comment on my blog. This is a great post, I love all your pics, and your ideas on organization are great! I like the idea of your toddler having a snack while you clean, very clever. It looks like you started blogging this year too? Would love to keep in touch! Haha, at our house sometimes the "Daddy's coming home!" clean-up is the only clean-up that happens all day! My husband works for himself, so his schedule can be all over the place. Sometimes he's home at 3pm, sometimes at 8pm. Makes it difficult to do the Daddy's Coming Home Clean-Up. So, instead, we do a quick clean up before each meal. All toys and books are put away and we start the next phase of our day on a clean slate. Thanks PR! 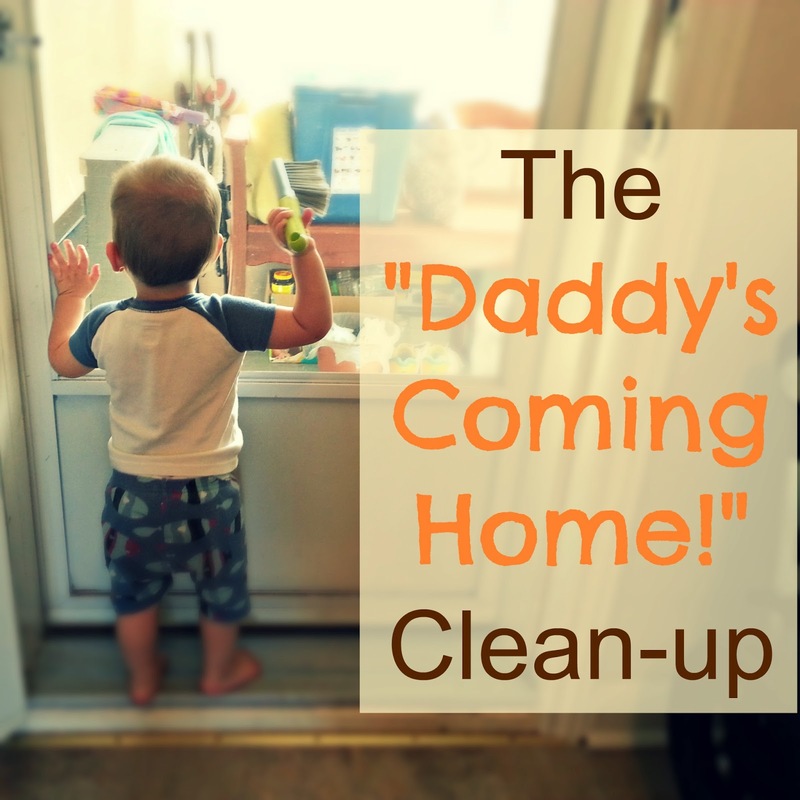 Three times a day clean-up is probably even better than once! Great post! the before and after pics really speak volumes. Love the pic of your little guy watching you from his chair - how did you keep him occupied all that time? 15-20 minutes is an eternity for one that age. That's so cute that your little one's trying to help you out with the cleaning! Do you really let him? I think it's a wonderful chance to teach little children how to be responsible by allowing them to help in the de-cluttering. I wouldn't hesitate to include my kids cleaning at our apartments in Sparks . Congratulations on being able to make your home look so tidy and clean. It is very difficult when having a child to keep all the toys at one pace and the kitchen mess invisible. Although I do tidy up and clean in the evening when it is quiet in the house, in the morning everything is the same. Pest Control , Cleaning Services Brisbane Services The Moving Force are your local and trusted pest control team for Brisbane and surrounding regions. Items are likewise made for washing things and machines. The items should dependably be utilized for the reason that they were made for. All rooms in the house should be cleaned.